And it worked! Over time, the PSTA bus hub relocated, WiFi was added, and the mayor started a monthly food truck rally in the park. Although there is still work to be done to clean up Williams Park, great strides have been made over the past few years. No doubt the opening of The Galley helped catalyze these efforts. It didn’t take long for The Galley to become a favorite among locals either. “I pop by often, for lunch, meetings, or a quick pilsners-and-policy chat with other patrons,” said Councilwoman Gina Driscoll. “It’s such a popular neighborhood spot sometimes I have trouble finding a seat!” In fact, you’ll occasionally find me at the bar enjoying the cuban sandwich, fried ravioli and a frosty Guinness. Owners of the Galley, a St Pete Tavern, to open The Ship’s Hold, a cocktail bar, in march. 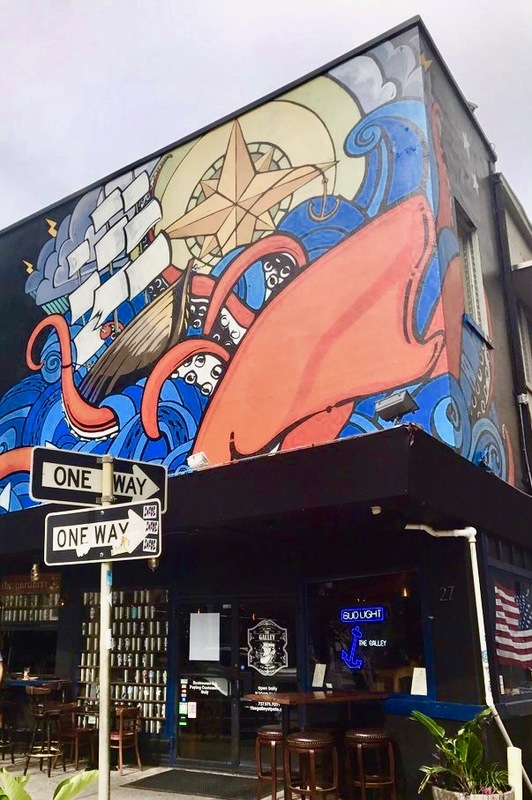 Now it’s time for The Galley to set sail on its next adventure — expanding into the parcel next door at 37 Fourth Street North, which formerly housed the Shisha Cafe Hookah Lounge. Continuing the nautical theme, the new space, dubbed “The Ship’s Hold”, refers to the lower part of the interior of a ship, often used for cargo. In this case, the cargo is liquor (with an emphasis on rum). Opening this March, The Ship’s Hold will expand upon The Galley’s bar-space and event-space, perhaps with a more intimate conversational atmosphere, designed to suit small organizations, businesses, and families. Among the focus on craft cocktails, The Ship’s Hold will hold the largest collection of fine & exotic rums on mainland Florida. The Galley regulars and Instagrammers are familiar with The Galley’s wall-sized map of Florida. Similarly, The Ship’s Hold will display a wall-sized map of the Caribbean, where many of the rums will be sourced. At St. Pete Rising, we couldn’t be happier to see the success of The Galley. Expanding cities often experience growing pains, such as rising rent, that make it difficult for small business owners to thrive. Luckily, we have locals like Boland and Taylor that are willing to invest in our beautiful, burgeoning downtown. The Ship’s Hold will be located at 37 Fourth Street North. After opening in March, “The Hold” will be open for happy hour and late-night revelry Wednesdays through Sundays, and will be open for events anytime day or night. The Galley is open 11:30 am to 3 am daily, with a late night menu 11 pm to 2:30 am. Bar includes local options along with full liquor and wine list. Be sure to follow The Galley on Facebook and Instagram to receive updates on the grand opening of The Ship’s Hold.